I had dinner with Tim earlier this month and received an advance copy of his brilliant new book, Correspondents. Meet Tim in July at East End Books Ptown. I could not put this book down from the Prologue to the conclusion. The book begins with one of the best Prologues I’ve read and ends in a devastating manner, that guarantees you’ll have difficulty pausing before the conclusion! · Correspondents moves from suburban Boston to the Middle East to tell the remarkable and poignant story of the youngest child of a sprawling Irish-Lebanese family, a journalist who is posted to Baghdad during the Iraq War, and the young interpreter who befriends her. 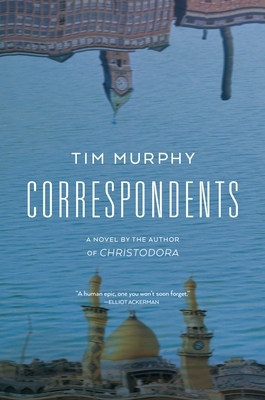 · Correspondents describes an America where immigrants are the foundation of the country and is closely based on Murphy's own Irish-Lebanese family. His depiction of Irish immigrants is reminiscent of Colm Tóibín's Brooklyn, and his deft weaving of a multigenerational story of immigrants, settlers, and refugees evokes Jeffrey Eugenides's Middlesex or Imbolo Mbue's Behold the Dreamers. Christodora was optioned by Paramount TV for a limited TV series directed by Ira Sachs and produced by Cary Fukunaga, who produced the award-winning Beasts of No Nation and directed True Detective and Jane Eyre. The world is Rita Khoury's oyster. The bright and driven daughter of a Boston-area Irish-Arab family that has risen over the generations from poor immigrants to part of the coastal elite, Rita grows up in a 1980s cultural mishmash. Corned beef and cabbage sit on the dinner table alongside stuffed grape leaves and tabooleh, all cooked by Rita's mother, an Irish nurse who met her Lebanese surgeon husband while working at a hospital together. The unconventional yet close-knit family bonds over summers at the beach, wedding line-dances, and a shared obsession with the Red Sox. Rita charts herself an ambitious path through Harvard to one of the best newspapers in the country. She is posted in cosmopolitan Beirut and dates a handsome Palestinian would-be activist. But when she is assigned to cover the America-led invasion of Baghdad in 2003, she finds herself unprepared for the warzone. Her lifeline is her interpreter and fixer Nabil al-Jumaili, an equally restless young man whose dreams have been restricted by life in a deteriorating dictatorship, not to mention his own seemingly impossible desires. As the war tears Iraq apart, personal betrayal and the horrors of conflict force Rita and Nabil out of the country and into twisting, uncertain fates. What lies in wait will upend their lives forever, shattering their own notions of what they're entitled to in a grossly unjust world. Epic in scope, by turns satirical and heartbreaking, and speaking sharply to America's current moment, Correspondents is a whirlwind story about displacement from one's own roots, the violence America promotes both abroad and at home, and the resilience that allows families to remake themselves and endure even the most shocking upheavals.